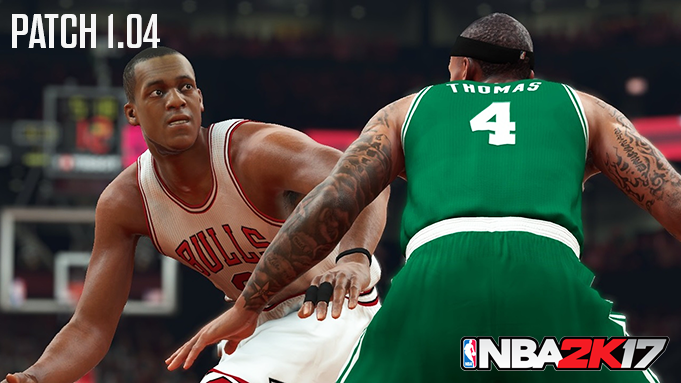 2K Sports is rolling out NBA 2K17 update 1.04 on Steam, saying that it'll start heading to the Xbox One for approvals soon. PlayStation 4 players already received the latest title update earlier today. It includes a couple of gameplay tweaks across the board, but more than those, it's bringing a fix for the annoying shot meter glitch which has been bothering players since first update. Check out the full patch notes below. Corrected an issue where some post-release uniform colors would clash with the opposing team's uniform in certain match-ups. After a made basket, the score will no longer update on the scoreboard until after the animation has completed; this should be much less confusing. Fixed a case where your friends list in the Who's Online menu would disappear while viewing it. Contact Dunk animations should now properly stay equipped on your MyPLAYER. The Relentless Finisher badge should now give the proper bonuses on contact layups when leveling it up. Fixed an extremely rare hang that could occur when a player was attempting to grab a rebound. Fixed a case where certain jump shot animations would result in the shot meter reporting an incorrect very late timing during high-latency situations. Addressed an issue where you would not be granted a win if your opponent disconnected during a Pro-Am Walk-On/Team game under certain conditions. Users in Ante-Up will now always be presented with the correct ante-up amount prior to joining the Got Next queue. Corrected a case that would result in loading into a black screen heading into a game. Connection events will now always appear on the schedule once you agree to them/set them up. Addressed a hang that could occur when attempting to enter the 3PT/Dunk Contest when your MyPLAYER was injured. Fixed a hang that could occur when loading into a Live Practice when a number of players on your team were simultaneously injured. The size of the patch on PlayStation 4 is 7.39 GB and 69 MB on the PC version. You might be wondering why there's a big disparity between the file size on consoles and PC. Well apparently the patch size on consoles has nothing to do with the real file size of the patch. There is a lot of redundancy being rewritten and the 7GB it's is just the allotment, it could have been only 69 MB, but Sony gave them that file size and with Sony that whole file has to be re-downloaded. The latest update will be downloaded automatically as long as your PC or PS4 is connected to the Internet. We will let you know when the patch arrives on Xbox One.